You are currently browsing the tag archive for the ‘aubrey/maturin’ tag. I think I can safely say that Post Captain is the best Austen homage I’ve ever read. The Aubrey/Maturin books are famous for their naval backdrop, but Post Captain starts out as a novel of manners. During the Peace of Amiens, Captain Jack Aubrey, now a rich gentleman, decides that country life is the thing for him, so he rents an estate close to a house full of marriageable ladies (sounds familiar?). Stephen goes with him and for the next 100 pages we see these two men maneuvering this social environment and often finding it more taxing than naval battles. I enjoyed meeting the two main female characters, determined Sophia and fabulous anti-heroine Diana (to whom both Aubrey and Maturin are attracted to). I’m sure it’ll be a pleasure to get to know them more in the next books. But soon this not so idyllic setting is broken by the news that Jack has lost all his money and needs to return to the Navy to make more and escape being arrested for debt. In Master and Commander we see these two men getting closer, but Post Captain is dominated by their conflict, that grows both because of Diana and Stephen’s spying activities. Both men don’t play much music in this book, instead, the story is filled with tension. 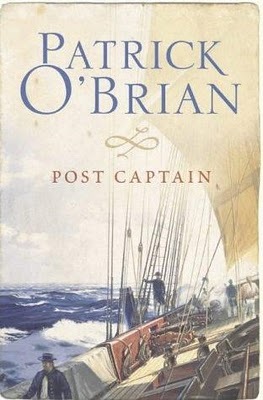 What’s amazing is that in the midst of all these undercurrents, O’Brian still makes the reading so much fun. There is a kind of joy to everything, from hunger, to possible arrest, to suicide missions. It’s all done with such gusto! I mention in my post about M&C that I really appreciated O’Brian’s approach to narrative, where sometimes he’s inside a character’s head and suddenly zooms out to a panoramic of the situation, to then just as quickly starts describing a canvas being pulled up. In Post Captain my attention was focused on time sequence, which felt almost dreamy. In one sentence Jack is telling Stephen how concerned he is about a meeting at the admiralty, and in the next sentence we already catch him in the middle of a conversation with the Admiral. There are also paragraphs that fast-forward you many months. It’s all done beautifully and once again I felt flattered that O’Brian assumes his readers can keep up. Once again I also felt the similarities with Dorothy Dunnett. It seems there is no proof that they ever met or read each other, so I might be imagining things. The fact is that these two authors have the knack to write in a way that stimulates and challenges me, that makes me go “wow, that was good!”. One trick they both use is starting a chapter with a scene that seems wholly unconnected with what just happened before: different place, different characters – what is going on? But if you’re used to their mischief you go with it and pay attention. For instance, once we know that Jack needs to flee from certain arrest a section opens in Carcassonne, with a convoy of English prisoners who are demanding entertainment from a passing nomad artist and his bear. Where are our heroes? Are they among the prisoners? Could they be disguised as guards? Are they going to make an entrance at any minute? Could… surely not! Could Jack be inside a bear costume, being made to dance by his “master”, Stephen?! So O’Brian’s talents did it again: great narrative, a pinch of romance, subtle wit, and elaborate historical detail – all combined to keep me awake at night. YOUR LAST CHANCE OF A FORTUNE! HMS Polychrest will shortly sail to scour the seas of ALL KING GEORGE’S enemies. She is desined to SAIL AGAINST WIND AND TIDE and she will Take, Sink and Destroy the Tyrant’s helpless man-of-war, without Mercy, sweeping the Ocean of his Trade. There is no time to be lost! Once the Polychrest has gone by there will be no more PRIZES, no more fat French and cowardly Dutch merchantmen, loaded with Treasure, Jewels, Silks, Satins and Costly Delicacies for the immoral and luxurious Usurper’s Court. whose brig Sophie, with a 28lb broadside, captured 100,000.s worth of enemy shipping last war. 28lb, and the Polychrest fires 384lb from either side! So what will she do, in this proportion? More than TWELVE TIMES as much! The Enemy must soon be Bankrupt – the End is Nigh. Come and join the Fun before it is too late, and then set up your Carriage! Captain Aubrey has been prevailed upon to accept a few more Hands. Only exceptionally wide-awake, intelligent men will be entertained, capable of lifting a Winchester bushel of Gold; but PERHAPS YOU ARE THE LUCKY MAN! Hurry, there is no time to be lost. Hurry to the Rendezvous at the – YOU MAY BE THE LUCKY MAN WHO IS ACCEPTED! No troublesome formalities. The best of provisions at 16 oz to the pound, 4lb of tobacco a month. Free beer, wine and grog! Dancing and fiddling aboard. A health-giving, wealth-giving cruise. Be healthy and wealthy and wise, and bless the day you came aboard the Polychrest!